This page contains all of the 4+ digit plates posted on the Heritage Number Plate Spotting Facebook page. The date noted below is the date the photo was posted on the page, which may not be the same date that the photo was taken. If you have any photos of Victorian heritage plates please visit the Facebook page and share them. This plate sold for $15,000 at the 2011 Shannons Melbourne Summer Classic Auction. 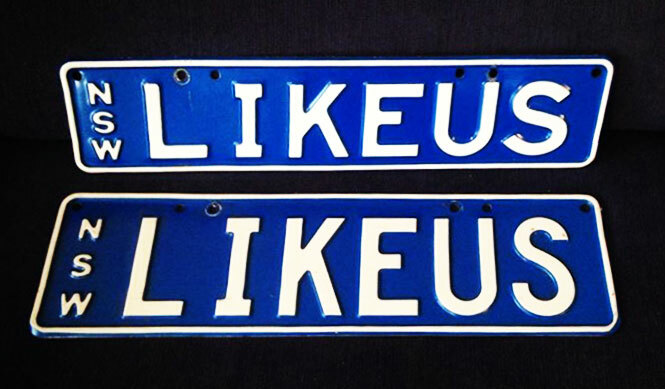 This plate sold for $26,000 at the 2009 Shannons Melbourne Summer Classic Vehicle Auction. This plate sold for $15,200 at the 2012 Shannons Melbourne Spring Classic Auction. It was previously posted on a Lotus (20 January 2015). Click here for the photo. Previously spotted on a Jaguar XK120 DHC back in the 1950s. Thanks to JT Publications for the historic photo. This plate sold for $14,000 at the 2014 Shannons Melbourne Late Summer Classic Auction. Click here for more repeating plates. This plate sold for $15,500 at the 2015 Shannons Melbourne Late Summer Classic Auction. This plate sold for $14,500 at the 2012 Shannons Melbourne Summer Classic Auction. This plate sold for $25,000 at the 2009 Shannons Melbourne Spring Classic Auction. This plate sold for $77,000 at the 2016 Shannons Melbourne Autumn Classic Auction. This plate sold for $47,000 at the 2006 Shannons Melbourne Classic Auction. The plate has previously been photographed on a Toyota Landcruiser. This plate sold for $36,500 at the 2015 Shannons Melbourne Spring Classic Auction. This plate sold for $31,000 at the 2010 Shannons Melbourne Winter Classic Auction. This plate sold for $16,000 at the The Premium Plate Auction 2011. This plate sold for $21,000 at the 2009 Melbourne International Motorshow Auction. This is the genuine heritage combination 1555, however it is on a custom slimline base, which was reportedly an error. You can read more about this plate here. This is the lowest bicentennial heritage plate on issue. This would have been a bicentennial plate which has been remade in enamel. See 1882 below for the correct bicentennial format. This plate would have been reissued in 1988 in the bicentennial format, but is shown here in heritage enamel. This plate sold for $27,000 at the 2010 Shannons Motorclassica Collector Vehicle Auction. This plate sold for $23,000 at the 2015 Shannons Melbourne Winter Classic Auction. This plate sold for $18,000 at the 2014 Shannons Melbourne Winter Classic Auction. This plate sold for $30,000 at the 2017 Shannons Melbourne Late Summer Classic Auction. 2266 – This plate is currently for sale via NumberPlates.com.au. Click here to view the listing. This plate style is very unique for a Victorian 4-digit heritage plate, however a VicRoads search confirms it is an all-numeric combination. This plate sold for $24,000 at the 2011 Australian International Motor Show Auction. This plate has previously been spotted on a Mercedes CLS500. This plate sold for $33,000 at the 2007 Shannons Melbourne Spring Classic Auction. This plate sold for $25,000 at the 2007 Shannons Melbourne Summer Classic Auction. Previously posted on a Mercedes A200 (June 2014). This plate sold for $25,000 at the 2015 Shannons Melbourne Spring Classic Auction. This plate sold for $15,000 at the 2012 Shannons Melbourne Winter Classic Auction. This plate sold for $17,000 at the 2014 Shannons Melbourne Late Summer Classic Auction. This plate sold for $14,000 at the 2013 Shannons Melbourne Spring Classic Auction. This plate sold for $33,000 at The Premium Plate Auction 2011. This plate sold for $17,000 at the The Premium Plate Auction 2011. It has previously been posted on a Bentley Continental (7 April 2014). Click here for the photo. This plate sold for $15,000 at the 2015 Shannons Melbourne Autumn Classic Auction. This plate sold for $13,000 at the 2013 Shannons Melbourne Spring Classic Auction. This plate sold for $18,000 at a the 2009 Shannons Melbourne Spring Classic Auction. This plate sold for $45,000 at the 2016 Shannons Melbourne Autumn Classic Auction. Previously posted on a BMW M6 (May 2014). The plate has also been seen on a Maserati GranTurismo. This plate was passed in at the 2013 Shannons Melbourne Summer Classic Auction. This plate sold for $31,000 at the 2011 Shannons Melbourne Summer Classic Auction. This plate sold for $30,000 at the The Premium Plate Auction 2011. Sold for $16,500 at the 2009 Shannons Melbourne Spring Classic Auction. Passed in at the 2010 Shannons Melbourne Classic Auction. Sold for $9,500 at the 2011 Shannons Melbourne Winter Classic Auction. Sold for $14,000 at the 2015 Shannons Melbourne Spring Classic Auction. This plate sold for $18,000 at the 2009 Shannons Melbourne Spring Classic Auction. This This plate sold for $29,000 at the 2009 Shannons Melbourne Spring Classic Auction. This plate sold for $14,000 at the 2013 Shannons Melbourne Late Summer Classic Auction. This plate sold for $14,000 at the 2013 Shannons Melbourne Autumn Classic Auction. This plate sold for $22,500 at the 2015 Shannons Melbourne Late Summer Classic Auction. This plate sold for $32,000 at the 2007 Melbourne International Motorshow Auction. This plate sold for $23,500 at the 2010 Shannons Motorclassica Collector Vehicle Auction. This plate sold for $17,000 at the 2011 Australian International Motor Show Auction. Previously been posted on a Honda Civic (June 2014). This plate sold for $46,000 at the 2016 Shannons Melbourne Autumn Classic Auction. This plate sold for $30,000 at the 2007 Shannons Melbourne Summer Classic Auction. This plate sold for $25,000 at the Premium Plate Auction 2011. This plate sold for $20,000 at the 2013 Shannons Melbourne Winter Classic Auction. Previously posted on an Aston Martin (September 2015). This plate sold for $25,000 at the 2014 Shannons Melbourne Autumn Classic Auction. This plate was passed in at the 2007 Shannons Melbourne Spring Classic Auction. This plate was passed in at the 2013 Shannons Melbourne Late Summer Classic Auction. It later sold for $12,000 at the 2013 Shannons Melbourne Winter Classic Auction. This plate sold for $18,000 at the 2014 Shannons Melbourne Spring Classic Auction. This plate sold for $14,000 at the 2014 Shannons Melbourne Winter Classic Auction. This plate sold for $22,500 at the VicRoads Auction 2010. This plate sold for $13,000 at the 2011 Shannons Melbourne Summer Classic Auction. This plate sold for $9,000 at the 2012 Shannons Melbourne Autumn Classic Auction. This plate sold for $12,000 at the 2014 Shannons Melbourne Winter Classic Auction. This plate sold for $16,000 at the 2009 Melbourne International Motorshow Auction. This plate sold for $28,000 at The Premium Plate Auction 2008. This plate sold for $20,000 at the 2014 Shannons Melbourne Spring Classic Auction. This plate sold for $17,000 at The Premium Plate Auction 2011. The plate has previously been posted on a Mercedes C63 AMG (September 2014). This plate is said to be owned by Sam Newman. Sam previously owned Vic 17 which was reportedly sold for more than $250,000 sometime prior to 2007. This plate sold for $6,500 at the 2013 Shannons Melbourne Spring Classic Auction. This plate sold for $22,000 at the 2007 Melbourne International Motorshow Auction. Previously posted on a Maserati GranTurismo (April 2015). This plate sold for $7,000 at the 2014 Shannons Melbourne Summer Classic Auction. This plate was offered at a Sotheby’s auction in 2010 with a guide of $45k – $55k. This plate sold for $11,500 at the 2015 Shannons Melbourne Spring Classic Auction. This plate sold for $10,200 at the 2005 Shannons Melbourne Spring Classic Auction. This plate sold for $13,000 at the 2012 Shannons Melbourne Summer Classic Auction. This plate was listed for sale in 2011 with an asking price of $22,500. It reportedly sold, however the sale price is not known. This plate is very unique as it is a heritage number that has been issued by VicRoads on a custom USA base. This is quite a special plate as it is the very last Victorian heritage plate issued. If you ever see a 6-digit plate higher than this one, it is a fake! These are simply custom plates which have been illegally remade in enamel by a third party. If you have photos of any special Victorian 4, 5 or 6 digit heritage plates we’d love to see them.